See I can keep secrets and so can the kids. We kept this a secret from hubby for over 2 weeks. The girls had childcare photos taken a little over 2 weeks ago but they offered us the opportunity to do all 4 girls together, so we took them up on the offer in order to surprise hubby and other family members. The last photo we had done of the girls was when Erin was a baby, 2.5yrs ago. Now we have an up to date pic. 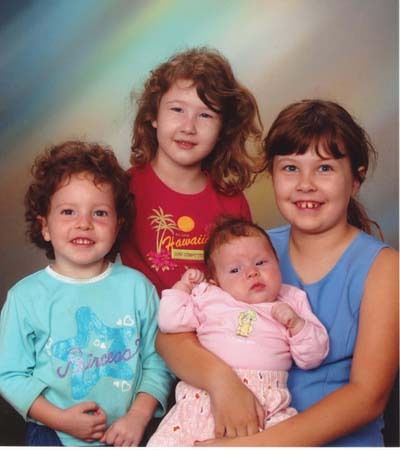 Miranda (almost 8) is holding Mercedes (3 months), Jadeen (5 years) is standing at the back and Erin (2 years) is standing on the side. Here are my beautiful girls. Note: Erin's hair stood out on end because we brushed it dry that morning. Her hair is naturally curly (tight ringlets) and goes fuzzy when brushed dry.